Soooo, it's time to tell you who was lucky enough to win all those fabby ribbons, that were kindly donated by Ali and Tony from Crafty Ribbons. 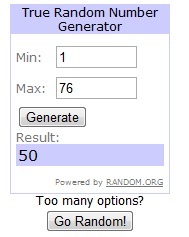 I used random.org to get the winner. And the lucky winner is ...................... No. 50. That is you, Regina. Congrats! :D You have til Friday evening to contact me to claim your prize. If I don't hear from Regina by Friday evening, I will choose another winner. Yippeee!! I am soooo happy ... I won this beauty! Thank you so much! I'll send you an email with my address.